We all need some time off of our computers, away from the stress of work and family and everything else in life to just reconnect with ourselves and the people we love —in person! And what's better than a trip to get away from it all. But planning a vacation brings its own stresses: Where to go, how to get there and who take with you. So. Many. Decisions. Deep breath. We've got you covered. We've teamed up with the brilliant minds at Ford Motor Co. to bring you all kinds of ways to bring love on the road and really connect with the people you love most. First up, take OUR QUICK "LOVE ON THE ROAD" SURVEY for a chance to win an uber-hip Fujifilm Instax Mini 8 camera. 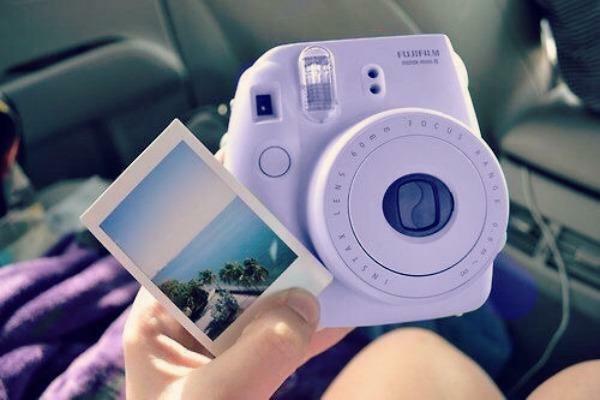 Five lucky people will score the instant-pic goodness to take on their travels! So tell us ALL about your favorite ways to hit the road, who's riding shotgun, and your #realtalk car confession; you can enter NOW through April 20, 2016. NEXT, we looked to the stars to help you find the answers to all your travel questions. Knowing the dominant personality traits associated with your zodiac sign makes planning a fabulous getaway easy-peasy. Go-getter Aries, you're always diving into work and life with gusto. Your ideas vacation: being surrounded by your besties in a place where you know an adventure is possible! Take a trek through the Amazon rain forest or, if you're looking closer to home, road trip it to the Rocky Mountains of Colorado. We know you're not the type to venture out into the unknown and prefer the comforts of the familiar. But that doesn't mean you can't go out and see new places. Be a tourist in your own town! Start with some local spots you've been meaning to visit. Rent a room in a nearby bed-and-breakfast near your "destination," perhaps it's a local vineyard to sample wines, the town center for some antique shopping or the beach for a nap under the sun. And don't feel pressured to bring anyone along. The solitude may be just what you need. Gemini, we know you're just a bundle of energy that can't be contained, and that means Europe is the perfect place to be! With your zest for life and endless energy, you'll have no problem trekking through Italy, France, Switzerland, Germany, etc., meeting new people, and immersing yourself in new cultures along the way. One thing's for sure: You'll never get bored on this trip! You have one of the biggest hearts, Cancer. Wherever you go and whomever you meet, you show nothing but care and concern for everyone around you. Know what would make you happy? A "volunteer vacation." Projects Abroad sends more than 10,000 people overseas to help with more than 450 opportunities that give back the region. Or take a look at Habitat For Humanity for helpful and heartwarming projects right here in our own country. Leo, you're confident in your style and the way you carry yourself. So the fashionable streets of Paris are where you need to be. Nibble a delicious croissant or some dainty French macarons under the shadow of the Eiffel Tower, and you're sure to be the center of attention. Intelligent Virgo, you have a thirst for knowledge and the desire to understand everything. You love taking a crack at a good mystery, so maybe you'd enjoy some time on a Mystery Cruise Ship. The gist: There's been a murder on the ship and your fellow passengers are the suspects. Your job is to figure out whodunit. Social butterfly Libra, you have a unique ability to make friends anywhere and at any time. Jump on a plane and head to New Zealand, dubbed the friendliest country in the world by Forbes. Enjoy the crystal blue waters, the evergreen terrain, the gorgeous mountains. Island-hop throughout the archipelago and meet various locals. And if you have the time, you can stop by Hobbiton, The Lord Of The Rings movie set left there by the production crew in 2001. We know how incredibly independent you are and how you prefer solitude most of the time. But you have an inquisitive mind. So for your next vacation, hop a plane to Amsterdam, a quaint city rich in history that's the perfect to explore alone on a bike. That means no awkward conversations with strangers on public transportation. Exactly the way you want it. Sagittarius, your thirst for adventure always compels you to go wherever your feet take you. So, now, instead of your feet, hop in your car and go in an impromptu road trip. Take your BFFs with you, because the more, the merrier! Stay the night in cheap motels some days, and fancy hotels in others. Find the oddest places to eat and order the specialty. Stop to see weird things (like The World's Largest Ball Of Twine in Kansas). Make memories to fill your children's and grandchildren's bedtime stories. You're always seeking to make yourself better. (You know, smarter, more talented, etc.) Why don't you take a trip to our nation's capital, Washington D.C.? Visit the various museums and galleries from the Smithsonian (for the arts) to the Newseum (to the news enthusiasts). Schedule a tour of the White House, and maybe you'll run into the president on his way to the kitchen for a snack. You'll be enriching your mind and having a great time doing it. You're a free spirit who loves to learn and meet new new and interesting people. Why don't you take a trip to Belize? The South American country is rich in history, culture, and marine life. You can explore the Mayan ruins in the jungle and then make friends with some fishes in the crystal blue waters of the nearby barrier reef. You can mingle with the locals and learn about their culture directly from them and no Rosetta Stone required — they speak English! Artistic Pisces, most of the time you doubt yourself and what you want, but you are incredibly devoted to your passions. You have a secret adventurous streak that's sparked when you're with someone who is equally as passionate. So grab your most daring friends, hop on a plane, and head to Stockholm, Sweden. Described as one of the safest cities in the world, Stockholm will make you feel perfectly at ease snacking at its cafes and walking down the cobblestone streets of the old town area known as Gamla stan. And we bet you didn't know that Stockholm is an archipelago made up of various small islands, so you and your friends can island-hop on a ferry and enjoy the calm of the waters. ​Before you make your time-off request and book your travel, be sure to take OUR QUICK "LOVE ON THE ROAD" SURVEY before April 20, 2016. We'll be rooting for you to win your own Fujifilm Instax Mini 8 camera. Good luck and bon voyage!